I am a 24 year old finalist in Miss Great Britain. I will compete against 52 other ladies for the crown on 13th and 14th September 2018. Over the last few months I have being volunteering and taking on challenges in order to raise money and help others. Back in May I climbed Snowdon for JPC COMMUNITY FARM. Since then I have volunteered my time to a Darlington care home for their summer fair and donated my gown to them in order for them to raise money to help their elderly residents have more fun days out. I have recently taken in the 24 hour national 3 peak challenge; Ben Nevis (Scotland), Scafell Pike (England) and Snowdon in Wales. 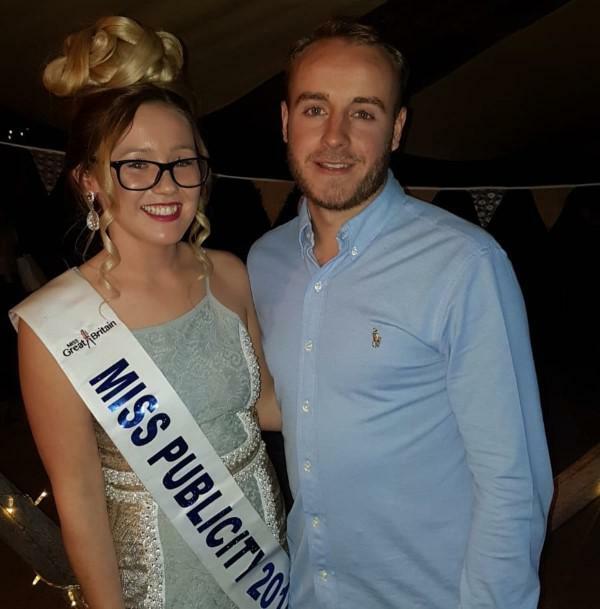 I recently hosted a live music and quiz night at the Hammer and Pincers Tipi – it was an amazing night with the quiz hosted by Aycliffe Radio’s Colin and amazing talented performers (Christina Simone, Olivia Irvin, Becky Sawyer, Corey Spence). We had some amazing prizes to be won and overall it was a great night with all proceeds raised going to Globals ‘Make Some Noise’ (a charity for children with illnesses and disabilities) and the Solan Connor Fawcett family cancer trust, a local Spennymoor charity which supports those with cancer and their families. I have put some questions together below with some comments, however if there are any other questions you would like answered please to let me know. How did it feel completing the challenge? The Three Peaks has been one of the hardest challenges I have ever done, I am not going to lie it’s a pretty gruelling experience! Unfortunately I didn’t have weather on my side making it even more difficult, at some points I couldn’t even see where I was going. As I was doing the challenge I went through a mix of emotions due to the changes in weather but knowing that this is for two amazing charities kept me going. It was extremely difficult especially having to travel within the 24 hours as well. How much did you raise altogether? In total I have raised £2000 for two amazing charities: Globals Make Some Noise which helps young children with illnesses or disabilities and The Solan Connor Fawcett Family Cancer Trust which is a local North East charity to help families and people suffering with cancer. Was the challenge itself tough? Yes, extremely tough when you remember Ben Nevis is in Scotland, Scafell Pike in the Lake District, England and Snowdon is in north west Wales. You have to climb up and down all 3 including driving to each of them within the 24 hours. It was a gruelling experience, I even slept in the car at Snowdon for a few hours to make sure I would be woken as soon as sunrise came, in order to finish my final climb of Snowdon before 8.30am which was the 24 hour cut off. As well as the climbs I have also recently hosted a charity quiz and live music night where people had an amazing time and the talent there was insane. I couldn’t be more grateful for the support I had on the night and this event helped me reach a higher fundraising amount. Will you be doing anymore challenges for charity? Definitely. I am a big believer in helping others. I believe you only have one shot at life so why not be kind, push yourself as much as you can and help those who need it? The Miss Great Britain rehearsals and final will take place 13th/14th September. I am so excited, it is so good to be involved in such a system that is not focused on looks, it is all about being yourself and working hard for what you believe in and are passionate about. Miss Great Britain is an amazing platform and I would love to use that platform to grow my charity work and work even harder. Mental health awareness is also very close to my heart. I suffered as a teenager and believe more awareness needs to be brought into schools. I would love to use my position and my story to make a difference and inspire others to get the help they need and to not hide away like I did.